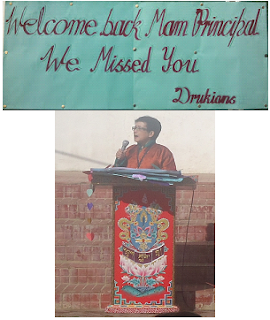 welcome Madam Principal back to the Druk School family. On behalf of all the Teachers and students of Druk School would like to takes this pleasure to welcome Madam Principal back to the Druk School family. All of us have anxiously waited for this day, the day of your return. Today, we are exuberant as any child would be to have his parents back after being away from home for sometime. We are truly happy to have you back with us. Once again welcome to Druk School.